What's Driving College Costs Higher? College is now four times more expensive than it was 3 decades ago, pushing student loan debt over $1 trillion. A key reason for this growth is the competition among schools for status and prestige, says Kevin Carey, education policy director at the New America Foundation. Just days before student loan rates are set to double for millions of Americans, President Obama and congressional leaders haven't reached an agreement on legislation to keep those rates at 3.4 percent. The debate reflects the growing concern over the debt burden many take on to get a college education. About two-thirds of bachelor's degree recipients borrow money to attend college, and collectively, student debt has topped $1 trillion. Kevin Carey, the director of the Education Policy Program at the New America Foundation, believes the student debt crisis reflects larger, troubling trends in higher education — among them excessive spending by colleges and universities, which drives up tuition, and declining government support for public universities as state and local governments face budget crises. In the past three decades, Carey says, college tuition has consistently increased much faster than both inflation and incomes. The percentage of all students taught by non- tenure-track professors – adjuncts, teaching assistants – has gone up and up and up. "Every year, [it increases] 2 or 3 or 4 percent above the inflation rate, to the point where college is now four times more expensive than it was, say 20 or 30 years ago," he says. Where does that money go? To all sorts of things, including administrative and teaching costs, scholarships, sports teams and elaborate new construction projects. "[Colleges and universities] compete with one another not to make money, but for status and prestige, so they buy things that increase their status and prestige in relation to their competitors," Carey tells Fresh Air's Dave Davies. "They're big on construction. ... They're always building things." College campuses may be expanding but that doesn't necessarily mean their teaching staffs are growing. Carey points out that the number of full-time professors has shrunk across the country — and that less than 40 percent of students are now taught by tenure or tenure-track professors. Making Headlines Since The '70s: Is College Worth It? "[Professors] are not the beneficiaries of large increases in college spending that has gone on," he says. "In fact, the percentage of all students taught by non-tenure-track professors — adjuncts, teaching assistants — has gone up and up and up." Meanwhile, university administrations have grown — meaning colleges are now employing more provosts, deans and assistant deans than ever before. "I'm sure that most of those people are working hard at real jobs," he says. "But that doesn't necessarily mean that it's a good idea to increase spending and pass along many of those costs onto students in the form of higher tuition. ... And the more the prices go up, the more that these students who are squeezed out of opportunity are middle-income students, low-income students, and the net effect over time is to make our college and university system no longer the engine of economic mobility that it once was." 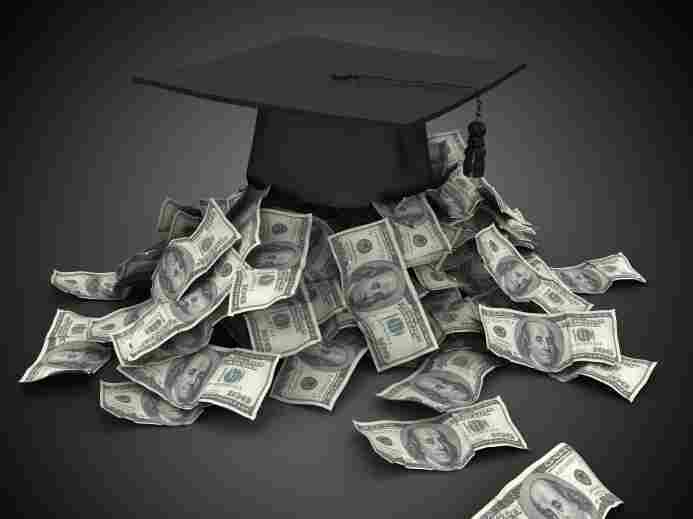 The average college senior in the U.S. now carries $25,000 in student loan debt at graduation. Those figures rise when graduate degrees are figured into the equation, Carey says. "No one planned for that to happen," he says. "No one thought that was a good idea because in fact, it's a very bad idea. The reality is that as college tuition has consistently outpaced the ability of people to pay out of pocket, debt has been the safety valve of our higher education system. It is what has allowed everything to keep running because people know they have to go to college — they don't feel they have any choice — so they just continue to borrow and borrow and borrow." Those debts will follow students around for decades, Carey says. "Democrat or Republican, liberal or conservative, if you want a quality college education, there's a good chance you're going to spend most of your 20s in a state of indentured servitude to a lender or an employer you hate but can't quit, because the loan bills — undischargeable in bankruptcy, thanks to industry lobbying — will follow you to the end of time," he writes in a recent New York Daily News op-ed. "Literally: The Washington Post has reported that $36 billion in loan debt is held by people over 60 years old." To change things, Carey says, colleges need to rein in spending — and perhaps modify their educational models. He points to Harvard, MIT and Stanford's recent experiments with noncredit online classes, which anyone can take around the world. "These are courses that are being taught to hundreds of thousands of students around the world and they don't cost anything," he says. "There is now no doubt that certain kinds of students can learn a lot online. But people don't just go to college to learn; they go to college to get a job. That's the difference between a library and a college." Stanford is now experimenting with giving class participants certificates noting that they took the class and scored in a certain percentile within the class, Carey says. "And in the end, all a college degree is is a piece of paper saying, 'Dear such-and-such, you took these classes and here's how you did in them,' " he says. "Nothing more, nothing less. It's a piece of paper that has the seal of approval from an institution that has itself been approved through accreditation, but the essential act of communication is the same." US News didn't invent the idea or the thought that status was a function of wealth, fame and exclusivity. You could say that about lots of things. What they have done is let fuel to the fire and created a mechanism by which universities that haven't been around for hundreds of years to climb up through the ranks and claw their way past their competitors from a status standpoint. "Universities don't do a good job of using their space. Go to any college campus on a Monday morning or Friday afternoon and you'll find empty buildings because professors and students don't like to go to class on those days." "Universities are run for the benefit of the people who work there. That's different than a for-profit corporation, which is run for the benefit of shareholders or a regular public agency that is run for the benefit of elected officials and the public. Our colleges and universities exist in an odd position. I think the closest analogy is organized religion, where you have nonprofit institutions that have been around for a long, long time. ... They sustain themselves. They have their own set of values. If you look at the decisions they make, those values are quite apparent. Particularly our four-year colleges and universities, the professional status is bound up in academia, in scholarship. And so these universities are organized in such a way that reflects that." "Professors are recruited and paid on their academic reputations, not whether they're any good at teaching. And there is a desire for status. There is a constant competition with one another. And the thing with reputational competition is that there's no end to it. You don't ever reach some point where you're as good as you can be because the only question is, 'Are you as good as the university in the next state?' So there's no ceiling to how much money colleges and universities can spend competing with one another." "They simply made numbers out of a value system that was already in place. They empiricized a sense of higher education quality that revolves around three things: wealth, exclusivity and fame. It's the wealthy institutions that have the smallest admissions rate and are the most well-known for their students and their professors that always stay atop the list. It's not a coincidence that every year Harvard and Princeton go back and forth between 1 and 2. US News didn't invent the idea or the thought that status was a function of wealth, fame and exclusivity. You could say that about lots of things. What they have done is let fuel to the fire and created a mechanism by which universities that haven't been around for hundreds of years to climb up through the ranks and claw their way past their competitors from a status standpoint."